Photo above from article in Ayrshire Post. Click here to view it. Photo above from article in Ayrshire Post. Click here to view it. 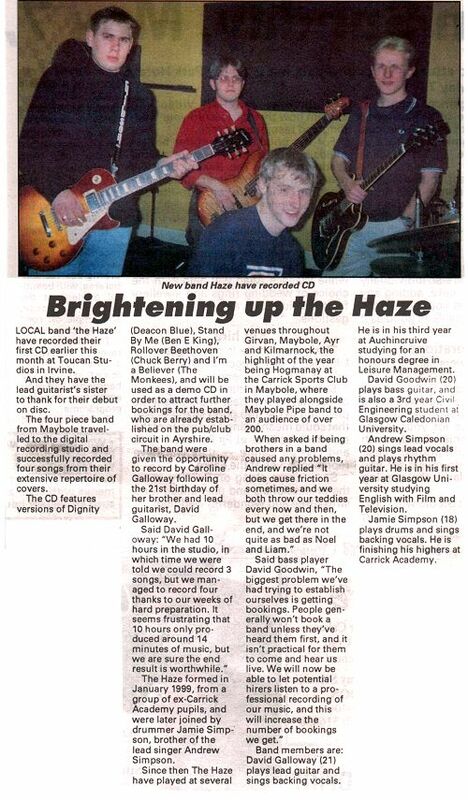 Maybole's own live rock band, The Haze, are a talented young four piece band who have been dubbed 'Ayrshire's top showband', and have performed in Ayrshire's top venues. 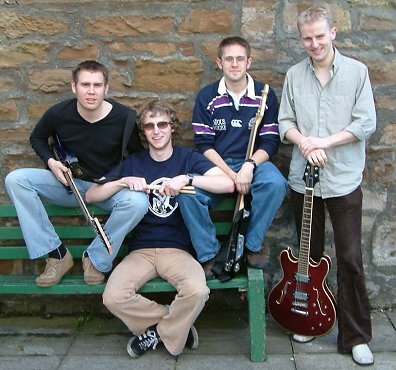 All four of the band live in Maybole and the band rehearse regularly in the Carrick Sports Club in Maybole. The band play mainly covers, ranging from The Beatles to The Mavericks, from The Eagles to The Stereophonics, but they are currently introducing their own material to their extensive repertoire. The band believe they stand out from their rivals in several ways. Firstly, unlike most of their rivals, The Haze perform only live music, and do not use any backing tapes at all, relying purely on guitars, drums and vocals to complete their sound. Secondly, The band believe in an honest, up-front approach to their business, and have proved 100% reliable since they began 18 months ago. They have never cancelled, or turned up late for a booking. Thirdly, the band believe in giving the audience what they want. Said lead guitarist, David Galloway, "When we set out, we listened to what people had to say about other bands that they had heard, and the most common complaint we heard was that the bands were too loud. "We play at volumes that are sensible for the size of the venue, and if we are asked to turn down the volume, it is not a big problem, as it can be with some bands." As well as introducing their own music to their set, they are also keen to record their own music. 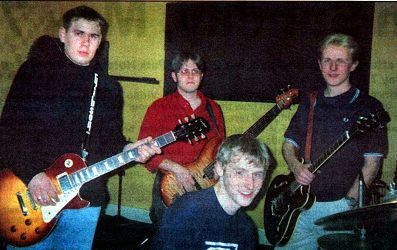 Said singer, Andrew Simpson, "We had been practising our own music for a couple of months, and some of our songs were given their big debut at a party on 15 July. 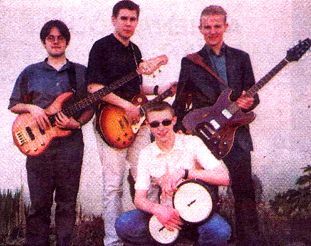 "We had always shied away from playing our own music in public, as we though as no-one knew the words it wouldn't get a very good reception, but surprisingly, the songs went down very well and many people were dancing. We were even asked to play more of our own material later on that evening, so we now have more confidence in our songs. "We are currently aiming to be back in the recording studio by the end of the year." * David Galloway is 21 and plays lead guitar, as well as singing backing vocals. He is also studying in his final year at Auchincruive Agricultural College for a degree in Leisure Management. * David Goodwin is 20 and he plays bass guitar and sings backing vocals. He is currently in his final year at Glasgow Caledonian University studying Civil Engineering. * Andrew Simpson is 19. He plays rhythm guitar and sings lead vocals. Andrew is now in his second year, studying for a Masters Degree in English at the University of Glasgow. * Jamie Simpson is 18, and is the brother of front man, Andrew. He plays drums and sings backing vocals and is currently finishing his highers at Carrick Academy. The Haze can be contacted by e-mail at hazemusic@hotmail.com.